Professional Development from the NUSTEM Team. NUSTEM offers a range of CPD sessions for primary teachers, which can be delivered in your school or at our Think Lab on the city-centre Northumbria University campus. Sessions are available free of charge for our partner schools (yes, you read that right), and at competitive rates for everyone else. Interested? Want to know more? Keen to make a booking? Contact us at nustem@northumbria.ac.uk! We most often run CPD on a bespoke basis, but occasionally we’ll schedule specific courses. If we’ve something specific planned as you read this, the dates will appear below – otherwise, read on for our menu and contact us using the links. Our CPD sessions typically last 90 minutes, and can be delivered to a maximum of about 20 participants. Unconscious biases are an integral part of human evolution. They allow us to make quick decisions based upon the evidence at our disposal. Unconscious biases are prevalent across society… and in your primary classroom. Our own research has shown that by Year 3, there are already strong gender differences in how boys and girls view themselves and the type of jobs they could see themselves doing in the future. In this workshop, we examine the science behind unconscious bias, begin to understand our own biases, and learn techniques for ensuring they do not have a detrimental effect on the learning of children in our schools. The session is informed by current research and aims to promote equity and equality for all. The Science for Families course is a 5-week after school science club aimed at children in KS2 and their families. Children and parents work together to explore different areas of the science national curriculum, through simple science experiments with everyday household items. 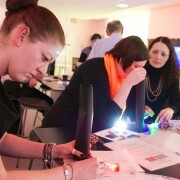 This Facilitator Training Session will teach your staff to deliver the Science for Families course within your school. The training will include everything needed to run as many courses as you wish, aside from a few easy-to-source materials. You’ll get hands-on practice at delivering all the experiments, printed and digital copies of the course booklet and access to the online resources which support the course. The session will also discuss how to get parents involved in school science lessons, and how to guide conversations with families around science. Are some parents hard to reach, or is it that we are not yet using the right tools and techniques to draw parents in? In this session we look at the NUSTEM approach to parental engagement, and the methods we use to extend science education beyond the classroom. Then we work together to identify school approaches to parental engagement, and consider our communications and activities with parents. Together we identify target groups for parental engagements, possible barriers to successful engagement, and appropriate tools and strategies. At the end of the session you will have a plan for developing future, successful engagements in your school. NUSTEM aims to build the science capital of young people and their support networks in the North East. Science Capital is a model for understanding why some children go on to study science and others do not, and a framework for developing science-related knowledge, attitudes and experiences and resources. In this training session we explore the concept of science capital, consider our own science capital and that of our pupils, and work through strategies and best practice for improving the science capital of our students. Since the introduction of the new science curriculum for primary in 2014, we’ve have lots of reports from teachers that the ‘good bits’ of the old curriculum have been taken out and they are finding it difficult to source engaging experiments to teach many of the new areas of the curriculum. This session will help teachers to understand the Working Scientifically strand of the new curriculum, and how to use their understanding to create exciting and engaging science lessons to cover every topic within the new curriculum. Teachers will learn strategies for generating new and innovative experiments which they can use in their classrooms. We offer this CPD on these five areas of the science curriculum: Electricity; Sound; Light; Evolution; Forces and Magnetism. Sessions are available in combinations, to suit.